Symptomatic osteonecrosis related to corticosteroids has a high risk of progression to collapse in absence of treatment. The purposes of this study were to evaluate the results of autologous bone marrow grafting of the symptomatic hip in adult patients with osteonecrosis and to compare the results with core decompression alone in the contralateral symptomatic hip. 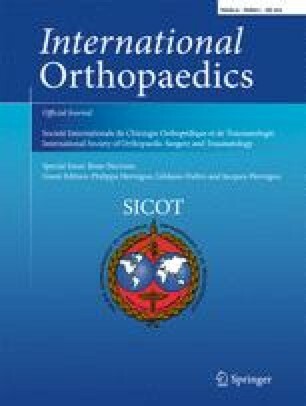 A total of 125 consecutive patients (78 males and 47 females) with bilateral osteonecrosis (ON) and who had both hips symptomatic and at the same stage on each side (stage I or II) were included in this study from 1988 to 1998. The volume of osteonecrosis was measured with MRI in both hips; the smaller size ON was treated with core decompression, and the contralateral hip with the larger ON was treated with percutaneous mesenchymal cell (MSC) injection obtained from bone marrow concentration. The average total number of MSCs (counted as number of colony forming units-fibroblast) injected in each hip was 90,000 ± 25,000 cells (range 45,000 to 180,000 cells). At the most recent FU (average 25 years after the first surgery, range 20 to 30 years), among the 250 hips included in the study, 35 hips (28%) had collapsed at the most recent follow-up after bone marrow grafting, and 90 (72%) after core decompression (CD). Ninety-five hips (76%) in the CD group underwent total hip replacement and 30 hips (24%) in the bone marrow graft group (p < 0.0001). Hips undergoing only CD were approximately three times more likely to undergo a primary THA (odds ratio: 10.0278; 95% CI: 5.6117 to 17.9190; p < 0.0001) as compared with hips undergoing an initial bone marrow grafting. For the 90 hips treated with bone marrow injection and without collapse, the mean volume of repair evaluated by MRI at the most recent follow-up was 16.4 cm3 (range 12 to 21 cm3) corresponding to a decrease of the pre-operative average volume from 22.4 cm3 (range 35–15 cm3) to 6 cm3 (range 12–0 cm3); as percentage of the volume of the femoral head, the decrease moved from 44.8 to 12%. Core decompression with bone marrow injection improved the outcome of the disease as compared with core decompression alone in the same patient. We thank Richard Suzuki of Celling Biosciences for the review of the final manuscript and help in translation. All procedures were in accordance with the ethical standards of the institutional and/or national research committee and with the 1964 Helsinki declaration and its later amendments or comparable ethical standards.